I remember my reaction upon first seeing this sticker largely consisted of wanting to defend God. As if the Almighty was somehow in need of assistance from me in the Kingdom’s Department of Justice. 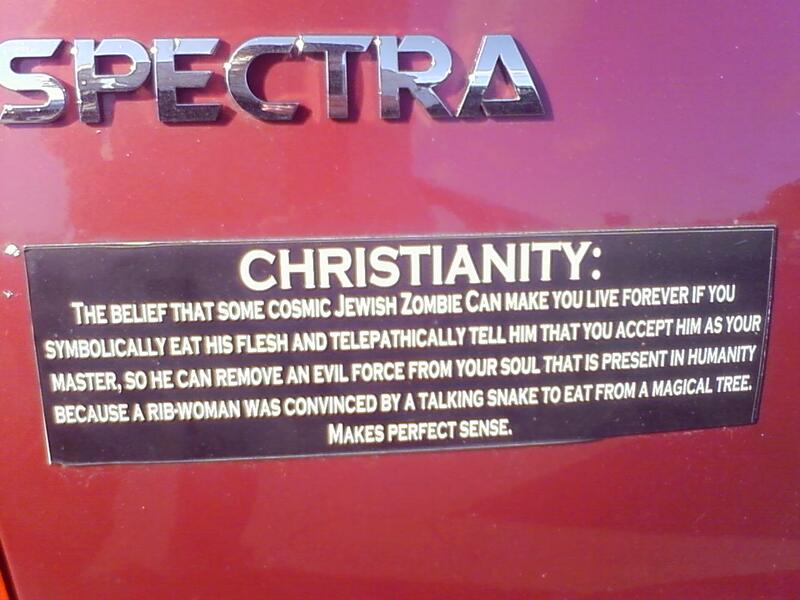 But I also found some joy in the creativity of the sticker’s author in manufacturing phrases such as “Cosmic Jewish Zombie” and the absurdity of faith from an outside perspective. I remember my next thought was wanting to find the owner of the vehicle to address each of the sticker’s allegations with a corresponding apologetic lesson. I even thought about doing a series of devotionals with the teens at church that would address some of the myths (and truths) that the sticker proclaims. But today I realize my initial reaction was largely consistent with a Western cultural response, not necessarily a Gospel response. A desire to confront inaccuracy with “absolute truth” over love. Please understand, I am not saying there are not absolute truths, only that I am sure I have been far more effective at times in communicating my distaste for those in disagreement with me than I was effective at preaching the “good” news. And herein lies a different truth, no one places the above bumper sticker on their car because they have read the Bible and patently found it false and despise Jesus. No, the reality is that those who would put this sticker on their car likely have had negative experiences with Christians and the church, perhaps directly correlated to a cultural belief within the church that to confront people with “truth” is a higher priority than the posture we take with them. That is to say, that somehow we feel God is pleased when we tell people of His supreme authority even if this message is delivered in an unloving manner that would prevent anyone from wanting a relationship with His church. A young man wished to train under a learned old Rabbi and said, “I wish to learn the wisdom of God, please teach it to me.” The rabbi replied, “You are much too young, come back in ten years.” The young man arrogantly responded that he had studied and mastered various forms of logic and that he was now ready to learn the logic of God. The rabbi responded, “Okay, I will test you. I will ask you one question and if you answer it correctly, you will prove yourself ready to learn.” The young man eagerly agreed to the terms. The point of the parable is that the young man was seeking a singular “right” answer, an absolute truth to the question, and the rabbi’s teaching indicated that embracing a life of faith necessitates that there isn’t always a “right” answer to grab hold of. Rollins expounded on the parable by saying that a life of faith is a journey of transformation, a shared life of belief, ritual and belonging. If we’re always solely focused on finding the “right” answer, perhaps we’re missing the point of the growth that occurs in the context of the shared journey. What if we were able to adapt a posture of humility, an attitude that perhaps we don’t have everything figured out? Yet in faith still confidently proclaim Jesus as Lord? What if I was able to see in that bumper sticker not a person in need of correction, but an opportunity to share in the wonder and mystery of the good news of Kingdom with a fellow created being? I don’t have this all figured out, but I’d like to believe that embracing a communal journey of transformation in Christ would make us an attractive people to the world. Perhaps even to the extent that nonbelievers who do not understand or agree with our theology wouldn’t feel it necessary to place bumper stickers on their cars to advertise their dislike of the church. What do you think?